4 – person camping tent is the best to use for a wide range of the group. If you often go camping alone or with another partner and bring a lot of gear and equipment or if you like going camping with your family which includes two adults and two kids, then a 4 – person camping tent is the ideal choice. In case you are looking for the best 4-person camping tent for your next trip, there are a few things that you should know such as the type you should look for. Also, having good care and maintenance of the tent will make sure it last as long as possible. If you are interested in knowing about such information, scroll down to read more about the best 4-person camping tent. Beginners in camping and you don’t know exactly what you need. If you buy one person or 3 – person tent, it might not provide you enough space for your belongings. Also, you don’t know how many people you want to go camping with, and 4 is the good number to start. When you are a solo traveler or a couple sharing a tent, a 4 – person camping tent is a good choice as it provides you enough space for you to feel comfortable. Also, there will be a lot of rooms for your items. And you might have spare space for a guest or when a pet joins you. If you want to have a light and comfortable tent that you can bring around but still very spacious and roomy, a 4 – person camping tent is your best option. A group of 4 adults, a four-person camping tent might not provide much space and comfort for you, especially when the type of tent you choose has a low ceiling. Also, if you guys all have a lot of stuff to bring with, there might be stuffy inside the tent. Also, if you want more privacy, then a four person camping tent might not be your best choice. The fundamental ridge tent: This is the most traditional and common type of tent with a ridge set up. It is suitable for beginners as it is easy to set up and carry around. Also, you would have a lot of stability with this tent. However, it is not as roomy as other types of tent. The dome: This tent has the shape of a half circle. 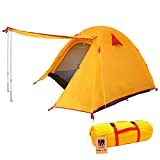 Unlike the fundamental ridge tent, it is very spacious and comfortable with a very wide floor area, but it lacks the stability to handle strong winds. The instant/ quick pitch tent: The frame of the tent is already connected to the layer, making it super easy for you to the set up the tent. A beginner can even make the tent ready in less than 5 minutes. The inflatable tent: This tent is also very easy to set up since you can pump the air for the camping tent to rise. However, it is one of the least common types of tents- you cannot find many models, and the price of this tent is also very high as well. Tunnel tent: If space is the most important feature that you look for in a tent, you can consider purchasing a 4-person tunnel tent as it is very spacious thanks to the layout of the poles inside the tent. Setting up for this type of tent will take longer time and more advanced skills. A 4 – person camping tent will provide you a lot of space. It will depend on the type of the tent you go for- for example, with the dome tent, you would be able to have a lot of head space so that you can walk around easily. With a room divider, you can divide the tent into two rooms for better privacy. Also, you can have much space for storage. A good 4 – person camping tent can be highly breathable and well ventilated. If you buy a 4-person tent for four adults, there would not be enough space for you to feel comfortable when sitting and sleeping inside. Also, having a guest to go camping with provides more troubles. In case there are windows around the tent, it will be quite hot. In some models, windows cannot be closed properly, creating a chance for rain to come inside your tent. Use floor protector to prevent dirt from getting into the tent. Floor protector also helps to reduce the rate of abrasion. And even when you use the floor protector, make sure you wipe it frequently to get rid of any stone or hard participles. Only pack your tent back into its bag when it is completely dry. If you need to pack when it is wet, remember to unpack and dry it as soon as possible. Make sure that when you pack the tent, all of the poles don’t snap together. Otherwise, it would be damaged. Clean your tent right away after you get back from your trip. You should only use mild soap and lukewarm water. Don’t wash it with too hot water as well as other strong detergents. The chemical ingredients from these detergents might penetrate into the camping tent and damage its quality as well as its waterproof properties. You can also use a soft bristled brush to get off stains on the tent. Just gently apply circular motions on them. In case you clean the windows and mud skirts, make sure you use a sponge and dry cloth. Don’t use the brush as it might cause stretches on the windows. First make sure the tent is completely cleaned, dry and hung up in a well-ventilated area. Then you can use a hard bristle brush to apply the seam sealer on the targeted areas. After that, wait for at least 12 hours for the sealer to dry up before using or storing the tent. On rainy days, make sure you adjust the tension of the tent. Different tensions might affect the dryness of the tent. Don’t cook inside your tent. Gas released from the cooking stove might damage the quality of the tent. In case it’s compulsory to cook inside, make sure you have enough air circulation. Wipe out all of the signs of condensation after you cook. When you use insect sprays, spray it away from the tent. Otherwise, the harmful chemicals might get into the layer and damage it. Don’t lean any heavy or sharp objects against the tent as they might damage the canvas of it. When it comes to this Coleman tent, there are various color options to choose including green, blue, orange and azure. There is one room to go, which is ideal for a cozy camping night. But, the feature I love the most is the detachable tent-fly with a middle tent for hanging electrical pole. It helps to bring technology and power inside the tent. Besides, thanks to the firm insta-clip attachment, you won’t worry about it falling when there are strong winds. One plus is the mesh roof for more sunlight and the rainfly to fight against weather. However, among three tents, this one is considered as the heaviest, which is 17.9 pounds. The dimensions are 7.1f (W) x 4.3f (H) x 7.1f (D). It offers a huge space inside the tent which can fit a queen size bed. It also offers sturdy and stable construction with thick tube inners. The material is extremely durable and can be re-waterproofed easily when the tent wears out over time. Last but not least, the modern WeatherTec™ System with patented welded floors and inverted seams can keep water out and help you stay dry during a rainy night. It is one of the heaviest 4 – person tents on the list. The screen vestibule is not sufficiently wide for folding chair. Verdict: If you want to have a good high-quality 4-person tent with porch, this is a good product you can consider. Compared to the Coleman, this tent is a duplicate. It has the same color options, which are green, blue, orange and azure. And the dimensions are 7.1f (W) x 4.3f (H) x 7.1f (D). There is one room to go with doors that can be opened from both inside and outside. The feature which is also my favorite is the multi-use of Outer Door. You can easily roll up the Outer Door curtain and Fixed with Buckle. Or another function is to store backpack and shoes. The feature might amaze you is its weight, only 6.2 pounds. This is unbelievable, isn’t it? This 4-person tent has one of the easiest installations. Even if you do it alone, it only takes you around 5 minutes to fully set up the tent. The material of the tent is made of high quality that it is waterproof and well ventilated. Also, it is SPF proof with a special UV coating and breathable nylon. Moreover, this tent is very compact and light so you can roll over and bring along with your backpack. It comes with a very reasonable price. It comes with no groundsheet. The poles of this product are quite weak. They might not be able to stand strong against big winds. Verdict: This 4-person tent can be used when you go camping on the hot summer days as well as in rainy seasons. 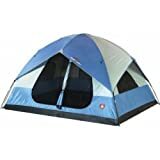 This tent is available in color blue and orange. It has the weight of 13.65 pounds and the dimensions of 10f (W) x 8f (D) x 6 (H). Even though it has fewer color options and is a bit heavy, there are two rooms to go with a removable divider. It features a double D door, three mesh zippered windows and mesh ceilings. With the removable room divider, you can enjoy a little bit of privacy. This 4-person tent is also very well ventilated and breathable with mesh ceiling to keep you cool during the summer. It is very lightweight and easy to carry around. It is very stable during windy days with four stakes. You can also add more stakes to make it even more secure. The mesh screen is quite dense and dark. 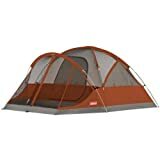 Verdict: This tent is suitable for two couples or just when you want to have an option to divide a big room into two smaller rooms for different purposes. Since a tent is a key gear in ensuring you have a good trip ahead, make sure that you spend time researching and planning carefully about what you might need. I hope that with all of the information above, you would be able to come up with the ideas of what you might need in the best 4-person camping tent and hence, can make the most informed choice at the end.